Sometimes there are blog posts that cut so deeply to the truth, the pain and the acute tragedy of infertility that I wish I could collect them up and put them in a book. I would then give the book to anyone who was in the life of an infertile person in the hope these beautifully sad words could help then go a little way to understanding the journey their friend, child or loved one is going through. These are two such posts. Tutti's picture, and her exploration of what it signifies, is one of the most poignant things that I have encountered whilst blogging and the analogy of infertility to the story of the little mermaid that jjiraffe makes is painfully perfect. I am a mermaid, we are mermaids. It makes so much sense. Thanks for sharing these. I'm not in a place to read right now, but I'm bookmarking this post to read later. Xoxo my fellow mermaid. Oh wow, I always wanted to be a mermaid, just not in this way . 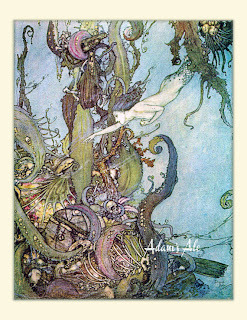 The little mermaid was always my favorite fairy tale (The one from Hans Christian Andersen). Thanks for sharing, those are indeed beautiful texts, and it does feel like we are somehow separated from the rest of the "mortals". "At one point, I thought how easy it would be to drown in those huge waves and sink to the bottom." ..."I knew that if I didn't want to be pulled to the bottom, to become a relic on the ocean floor, I had to make the choice to swim against the tide." "Filling our lungs with life and hope until we reached solid ground. I'm tired, scared, and don't know which direction is up any more, but I will fight to get to the surface with every ounce of strength I have left." They're pretty amazing posts, aren't they? Probably one of the most accurate depictions of dealing with infertility and loss I've ever seen. Thank you so much for sharing these. Beautiful posts that others need to read. Oh Luna, you have made tears spring into my eyes. Good tears. Thank you for your words. Support and love are needed right now and I'm receiving those in bucketfuls from those in this community.